Posted on February 28, 2017 at 6:43 pm. Helen Macdonald wrote an article for the New York Times entitled, “Why Do We Feed Wild Animals?” In it, Macdonald explores why we choose birds to feed over other animals, what it does for us psychologically, and whether this act is helping or hurting the animals. She argues that it helps us, but hurts them. This article has raised an old question within the community of bird-lovers: is it okay to feed the birds? While the winter survival rates for birds are increased by feeders, with it comes some concerns. Some researchers worry that disease is spread through the use of bird feeders due to concentrated amounts of feathers and excrement. Another concern is that the birds will become too accustomed to eating from feeders, which will encourage them to stop foraging, and ultimately become dependent on an artificial food source, one that may not always be there. Winter feeding particularly encourages untimely breeding, which leads to hatchlings being born during the winter instead of in the spring where there’s an abundance of insects for them to eat. This leads, not only frail hatchlings, but malnourished adult birds as well. The food necessary for a balanced diet varies between species, and many cannot stay healthy on feeder food alone. Despite these concerns, more research is needed in order to gain an exhaustive and indubitable understanding of the long-term effects bird feeders will have on the welfare of birds and our ecosystem. Although many bird enthusiasts advocate against the use of feeders, more than 40 percent of U.S. homes remain unconvinced of the risks and are not yet ready to give up the practice. 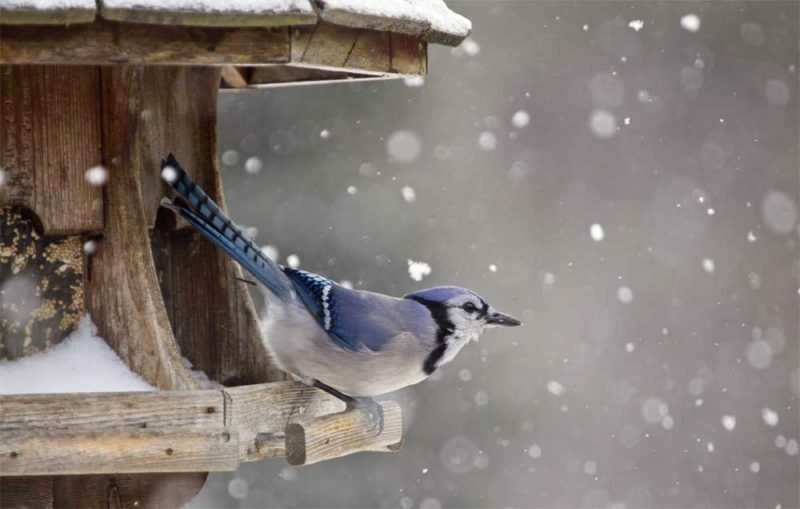 Willi Evans Galloway wrote an article this November titled Why It’s So Important to Feed Your Backyard Birds This Winter. The article encourages gardeners keep feeding birds this winter despite the split jury, and it includes tips on how to make your winter bird feeder more helpful. Galloway and other bird enthusiasts urge those who choose to still use bird feeders to be sure to maintain it properly with weekly washes and by purchasing diverse bird food (switch out those sunflower seeds for something with a bit more sustenance!). If you haven’t made up your mind, don’t worry! There’s lots of ways you can attract birds to your yard! Whether in addition to or in lieu of a feeder, you can also attract birds with bird baths, wildlife brush piles, choosing plants for your garden that will encourage foraging, and leaving your yard’s fallen leaves where they lay. Happy Birding!